Fellow Hobbyists: Please see Hal's email and respond accordingly. VPCCC Delegates: Please pass to your memberships – Hal's email address is halhartel@gmail.com. I had the opportunity to speak with Brad Hoffman Friday afternoon. I'm excited both for the hobby and Brad. I sincerely hope the event does well for all. As a member of VPCCC (Live Wire Media) I offered Brad candid & constructive feedback on the event from event participants and such. PLEASE feel free to share your info with me, both good & bad. If you want it direct to him or confidential please let me know that. I believe strongly that this could be a good thing for the hobby & our community. Enjoy the weather … HaHa .. it's an indoor show! Please see the attached from today's DP – And note the coownership . Congratulations Jeffersons and good luck to all participants!! Thanks for attending (or trying to attend) ...It was a great YCRC Mass Meeting ! Thanks for attending (or trying to attend) the YCRC Mass Meeting tonight. For those of you that couldn't make it, don't feel bad ... For those of you who braved the snow, you made a BIG difference! Both candidates were good people. Both gave good speeches. Both had lots of supporters out there. But Shirley Charles won and this will be a good thing for York County. For those of you that didn't pre-register to join the YCRC, if you want to get involved in helping restore York County to a principled based government, please let me know. è Tonight is our York County Republican Mass Meeting at Grafton Middle/High School Auditorium (turn at light opposite WaWa on Hwy. 17 to get to GMS/GHS campus). Please park on the Middle School side (to the right when entering campus) as that auditorium door is the one that will be unlocked. The registration/check-in begins at 6 PM with the meeting beginning at 7:30 PM. You MUST be in the registration/check-in line by 7:30 PM to be able to be checked in, vetted, and receive your ballots. If you are late (not in line by 7:30), you will not be allowed to register. (I suggest you arrive early as over 200 voters Pre-Filed to vote tonight and “walk-ins” are welcome to add to that number!) Just as in a “regular” election, you must show your valid Voter ID Card or a valid photo ID (drivers license, military ID, school ID, etc.) that shows your name and picture. There will be two (2) check-in desks in the inside “lobby” area next to the auditorium that will be marked by signs: one for those who submitted their Pre-File Form by 5 PM on 8 March (and have not been contacted by the Credentials Committee as not being a registered voter), and another table for those who “walk-in” tonight to have their York County voter registration checked via computer or phone call to York County Registrar by Credentials Committee Chairman. Those “walk-ins” must sign the Republican Affirmation Statement document at the check-in table to be able to vote. (Those who filed a form already signed this on their Pre-File Form.) There is a voluntary $5 fee to help defray the costs of this Mass Meeting (advertising, printing, supplies, etc.) that may be paid by cash or check at the registration table. è At the time you are checked in, you will receive your ballots. There is no early voting, and you cannot give your ballot to someone else if you decide to leave before the voting begins, as only one ballot per voter is allowed, and proxies are not allowed. If you leave before the voting time, you forfeit your ability to vote. Keep your ballots in your hands at all times as these are your voting credentials. If you lose your ballot packet, you may NOT get another one. Please bring a pen or pencil with you to mark your ballot. As is normal for any GOP Unit Chairman when requested by a candidate, candidate’s supporter, or issue representative, information may be forwarded to the Unit’s membership and other Republicans. Doing so shows neither support nor endorsement, as is evidenced by my comment, “YCRC Member Sheriff Danny Diggs requested I send this to you.” It is merely passing along information. It is not the Unit Chairman’s responsibility to inform opposing sides/views of others’ requests – that’s their campaign’s job to be “on the ball” and thinking about how to get their message out to voters; each campaign has different timelines and methods for advertising. It is not the Unit Chairman’s duty to act as a “go between” among campaigns. « Remember – the YCRC is an Official Unit of the Republican Party of Virginia and, as such, is required to follow the RPV Plan of Organization, known as the RPV Party Plan. (just like a Charter in other organizations) You can find the RPV Party Plan on www.rpv.org . I look forward to seeing you all at tonight’s York County Republican Mass Meeting for voting and to hear some of the candidates for the Republican nomination for US Senate and other scheduled guest speakers. I know this is a sacrifice, but it only happens once every 2 years !! ANYONE that is a registered voter in York County can attend and vote, no pre-registration was needed. Can you think of anyone else that you can bring to the meeting? Almost every constitutional conservative that l know of is supporting Shirley Charles. She is a principled woman of integrity. A few months ago when Shirley Charles called me and asked for my support in her running for Chair of the York County Republican Committee, I asked her why was she running. She said servant leadership in local government was her dream. She went on to state she believed our county needed principled leadership focused on what she now calls her 3-point plan. Shirley is a principled, experienced leader, desiring and choosing to serve the people of this county. I ask you come to the county’s Mass Meeting tomorrow evening and VOTE FOR SHIRLEY CHARLES, CHAIR, YORK COUNTY REPUBLICAN COMMITTEE! YCRC Member Sheriff Danny Diggs requested I send this out to you. Lynda, could you please send this out to all of those who are either pre-registered to attend the mass meeting, requesting committee membership, or election as delegate? 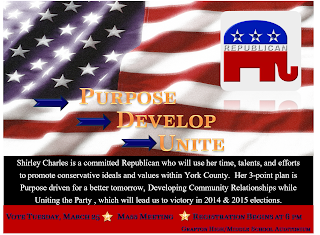 The York County Republican Mass Meeting will be on March 25th to elect the new Committee Chairman. I will be voting for ROBIN MILEWSKI as York County Republican Committee Chairman and I am asking you to voter for her, too! I am supporting Robin because she is running for the right reasons. She was not asked to run by anyone and was not recruited! She decided on her own accord. She saw the need for someone to step forward and realized that she had the skills necessary to get the job done. She does not have any hidden agenda or cause of her own other than wanting to bring York County Republicans together in an effort to get Republicans elected. Robin is uniquely qualified to serve as our chairman. and volunteering hundreds of hours as Mrs. Claus within our local community. She most recently has served as the York County Republican Committee Secretary when no one else was willing. Lastly, I know the kind of person that she is. I know that Robin is honest, hard working, and has the kind of integrity that we need in political service. VOTE FOR ROBIN MILEWSKI FOR COMMITTEE CHAIRMAN! Thanks again for taking the time to participate in our political process. It has come to my attention that all over the state, the outcome of mass meetings are being controlled and manipulated. Our Mass Meeting will be held at the Grafton High School/Middle School Auditorium, 405 Grafton Dr., Yorktown, VA 23692, starting at 7:30 PM (registration starting at 6:00 PM) local time on Tuesday, March 25, 2014. The purpose is to elect a chairman, committee members, and delegates to our state convention. Please come meet the candidates and vote! Examples of "Chicago politics" last week in Virginia! 1)"Last night, the purge of conservatives in the Republican Party of Virginia continued- as duly filed delegates from Campbell County were "slated-off" in yet another attempt at Establishment control. As with previous attempts, they invited in known Democrats to aide them in their bid for power- denying numerous delegates the opportunity to go to the Fifth District and State Conventions." 2)"They even excluded dedicated members of the Richmond GOP committee, including the hardest working member of the party, a campaigner so effective you could track where he was responsible for the ground campaigns by the anomolously higher Republican voter turnout for the precincts." 3)"The Republican Party of Virginia Beach has not slated delegates since 1983, as it is a generally understood practice that disenfranchises voters and unnecessarily limits participation in the party." Just so you know, I support Shirley Charles, young, fresh, and dedicated to uniting and rebuilding the local party. Fellow VPCCC Delegates: Reminder FYI – Please check the updated PD column on the attached roster and proceed as requested in the earlier email. Only two more days to RSVP! One Koch-brothers funded group alone has spent $27 million on anti-Obamacare ads -- since August. Our work is the most powerful force pushing back on that cynical campaign full of misinformation. We're finalizing our budget on Monday, and we need just 2 more grassroots donations from Yorktown to reach our goal. Can we count on you to chip in to help fight back? These groups are spreading myths and scare tactics, which tend to come unraveled upon little investigation. They're fighting an uphill battle with all that money -- while they've been running their fear campaigns, 4.2 million Americans have already signed up for coverage. At the end of the day, that's what matters -- getting people affordable, quality health care. And that's why we're going to put everything we've got into the next 17 days. Some of these guys on the other side really have no shame. They're spending millions -- mostly on myths and scare tactics -- to try to discourage people from getting the affordable, quality care they deserve. A Koch brothers' group alone has spent $27 million since August. Robert, we know the only thing that beats that kind of money is real, on-the-ground organizing. So we're going all in for the next 17 days. We're finalizing our budget on Monday -- and we have an aggressive goal. We need just 2 donations from Yorktown to reach it -- will you make one today? Chip in $5 or more right now, and let's fight back. Here's the thing: After all that money the Koch brothers and their friends have spent, more than 4.2 million Americans have already signed up for coverage on the marketplace. Obamacare is working. Folks can no longer be denied coverage because of a pre-existing condition like pregnancy or diabetes, and women can no longer be charged more for the same plan than men. When it comes down to it, I'm proud to be on the side fighting for health reform, and I hope you are, too. There are just 17 days to go -- let's put everything we've got into this last push.